The anticipation is finally over! 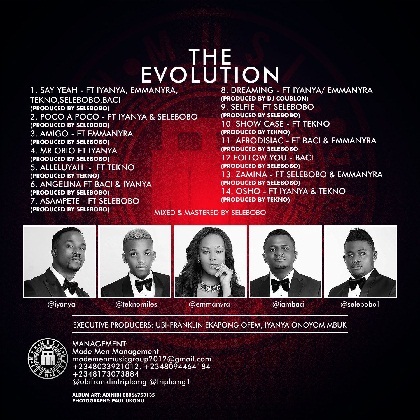 One of Africa’s freshest hit making music labels, Made Men Music Group, will release the first official group album titled, ‘The Evolution’ on May 29, 2014. The Evolution is a title that makes reference to the portrayal of how the artistes have evolved the industry through their new age sound and production. Label CEO Ubi Franklin referred to ‘The Evolution’, as a gift to fans through music across Africa and the world. International singing sensation, Iyanya, who is also a co-owner of the label expressed that, “This project portrays the different talent that we posses within our camp through music production and vocal range, and I’m very honored to be apart of this Album and the Triple MG enterprise.” Iyanya, who never disappoints on a record, made his vocal presence felt on songs like ‘Mr. Oreo’ and ‘Poko’, hammering home the point that he remains one of a few artistes in Africa who has the ability to sing and switch his style which enables him to entertain at the same time. The Evolution shines the spotlight on all the acts on the label, giving a glimpse of their varying talents. Iyanya and Emma Nyra, are joined by new recruits Selebobo, Tekno Miles and Baci. With something on the album for every music fan, ‘The Evolution’ is a celebration of the current genres of popular music that ranges from, hiphop and r&b to highlife, afropop, and afrobeats, which are all enjoyed by African music lovers. This debut album also ensures that all the different sounds of music are served to the public covering everything from the dance floor (up tempo), to the bedroom (slow tempo). Through singles like ‘Say Yeah’ featuring the entire stable, this album guarantees listeners the opportunity to enjoy Triple MG’s stars at their music making best. Bursting onto the music scene, are two fantastic young artistes named Selebobo and Tekno Miles, who portray their production skills within the camp, and are both key elements in the arrangement and selection of beats, which makes for an awesome listening experience for the fans. Selebobo, who is well known within the music industry as a singer/producer, took his all round quality to another level while displaying key elements of why he was snatched up by the record label through songs like ‘Poko’ and ‘Asampete’. Tekno Miles, who is another fresh signee is able to portray his vocal range on songs like, ‘Ocho’, as well as his production prowess on the song. Finally, the label introduces another fresh face to the camp who goes by the name of Baci. Baci, who specializes in pop and r&b, is able to show off his range in the first single off the album entitled, ‘Angelina’ which features vocal prowess from labelmate Iyanya to further entice fans. Overall, ‘The Evolution’ is a project that will display the genuine love of music that each of these artistes represents from each of their respected areas throughout the diaspora. Music lovers are invited to sit back, relax, and enjoy the official release of ‘The Evolution’ better known as Triple MG’s musical gift to the world. This entry was posted on May 20, 2014 at 12:59 pm and is filed under Uncategorized. You can follow any responses to this entry through the RSS 2.0 feed. You can leave a response, or trackback from your own site.